Eznis’ acquisition of the Q400 aircraft follows the type acceptance certification that was awarded by the Civil Aviation Authority of Mongolia in May, 2012 for operation of the aircraft in the Central Asia nation. The certification in Mongolia preceded the decision in June, 2012 by the Interstate Aviation Committee (IAC) – commonly known by its Russian acronym, MAK – to award aircraft type approval to the Q400 turboprop for operation in Russia and the Commonwealth of Independent States (CIS). “The Q400 aircraft is leading Bombardier’s expansion across much of Asia and the certification in Mongolia, in addition to the recent type approval in Russia and the CIS nations, are an important part of our strategy,” said Rod Sheridan, Vice President, Customer Finance, Bombardier Commercial Aircraft, who leads the business unit’s Asset Management Group (AMG). The AMG is dedicated to the management and remarketing of Bombardier’s previously owned commercial aircraft portfolio. 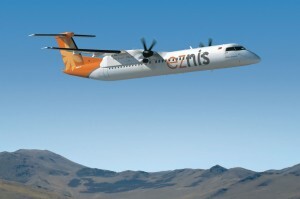 “We’re delighted to welcome Eznis Airways as one of five new operators that have ordered or acquired the Q400 aircraft this year and the first in Mongolia,” added Mr. Sheridan. Powered by two new-generation, 5,071-shaft horsepower (shp) PW150A engines, and capable of flying at a speed of up to 360 knots (667 km/h), the Q400 aircraft can quickly climb above the strong summer head winds which blow across Mongolia, and also access the high elevation airports in mountainous regions of the country. Its steep approach capabilities allow the aircraft to quickly descend over the mountains to easily navigate the strong northerly winds found at Chinggis Khaan International Airport in UIaanbaatar, where Eznis is based. The Q400 aircraft has been certified for gravel runway operations that predominate in rural Mongolia, which enables Eznis to fly mining charter customers directly to mine sites, while the aircraft’s large baggage compartment allows ample storage of mining provisions.